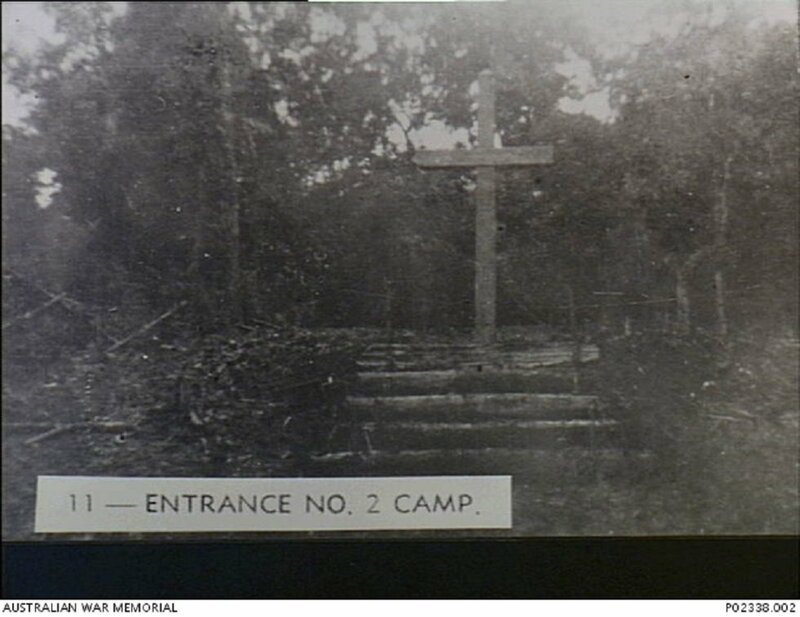 A wooden cross stands at the top of log steps at the entrance to Konyu 2 POW Camp (later known as Malayan Hamlet) on the Burma-Siam Railway, where H Force POWs were imprisoned. This photograph is number 11 in a series marketed by the Far East Picture Company and originates from material used in the Rabaul War Crimes Trials, taken July 1943. Image donated by H. Clarke, provided courtesy of James Bunning, Australian War Memorial. 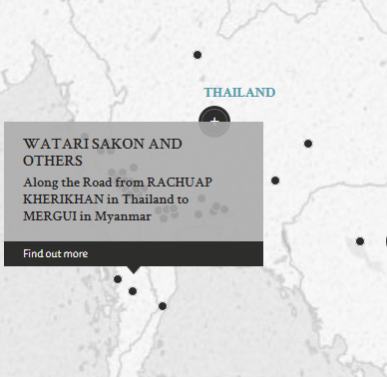 All the defendants were in charge of a group of Allied POWs who were tasked to work on the construction of a road between Prachuap Kherikhan, Siam (present-day Thailand) to Mergui, Burma (present-day Myanmar and were charged with ill-treatment of the POWs which resulted in their deaths mainly via beatings and poor living conditions in the camps that they stayed in where hygiene was poor and there was limited access to medicine. The 1st defendant, Lieutenant General Watari Sakon was in charge of the 29th Mixed Infantry Brigade which was tasked with building the road using POWs. The 2nd defendant, Colonel Terui Yuji was the commander of the No. 160 Independent Infantry Battalion which was also ordered to construct the road using POWs who had previously been working on other construction projects. The 4th defendant, Captain Hayakawa Tetsuzo was in charge of POW transportation along the road. The 8th defendant, 2nd Lieutenant Nanye Koji was placed in charge of the POWs working along the road. The 9th defendant, Sergeant Major Hiruta Katsuyuki was the liaison Non-Commissioned Officer between the 29th Brigade and the Corp it was part of. Both he and the 2nd Lieutenant Nanye Koji despite their lower military rank, were found to have ill-treated the POWs by beating them. The 1st, 2nd, 4th, 8th and 9th defendants were found guilty of ill-treating the POWs. The Confirming Authority when confirming the sentence, felt that the 1st defendant had done all he could to rely on non-POW labour and that he had voiced misgivings on the use of POWs for labour and reduced his sentence to 5 years' imprisonment. The 3rd defendant, Captain Shirai Yutaka was a Company Commander in the Engineer Unit of the 29th Brigade which used POWs to maintain and build the road but was not in charge of the POWs. The 5th and 6th defendants, Captain Nakase Shigeru and Lieutenant Morikawa Masao were in charge of maintenance along different stretch of the road and of the POWs employed on their own stretch. The 7th defendant, Lieutenant Asao Tadashi was placed in charge of the POWs working along the road. The 3rd, 5th, 6th and 7th defendants were found to be not guilty of ill-treating the POWs. Most of the prosecution's evidence was entirely by affidavit with only one witness having actually worked on the road. The Defence attempted to argue that the deaths of the POWs was due to them already having worked on previous construction projects and the lack of medicine available due to the ongoing war and that the Japanese Imperial Army's insistence on using POWs for construction was to blame. Such arguments were not apparently considered by the court. Watari, Sakon. Lieutenant General. From Japanese military. From Japan. Guilty. 10 years' imprisonment. Sentence confirmed with mitigation. 5 years' imprisonment. Terui, Yuji. Colonel. From Japanese military. From Japan. Guilty. 10 years' imprisonment. Sentence confirmed. Shirai, Yutaka. Captain. From Japanese military. From Japan. Not guilty. Hayakawa, Tetsuzo. Captain. From Japanese military. From Japan. Guilty. 7 years' imprisonment. Sentence confirmed. Nakase, Shigeru. Captain. From Japanese military. From Japan. Not guilty. Morikawa, Masao. Lieutenant. From Japanese military. From Japan. Not guilty. Asao, Tadashi. Lieutenant. From Japanese military. From Japan. Not guilty. Nanye, Koji. 2nd Lieutenant. From Japanese military. From Japan. Guilty. 7 years' imprisonment. Sentence confirmed. Hiruta, Katsuyuki. Sergeant Major. From Japanese military. From Japan. Guilty. 5 years' imprisonment. Sentence confirmed. Khan, A.M. Major. From British Indian Army. B.A. L.L.B. Allahabad. Sugimatsu, Fujio. Public Attorney, Demobilisation Board, Tokyo.